Comments: This species, actually a shelduck, has no history of vagrancy to the Western Hemisphere. It has been reported a few times in Nebraska with no discernible pattern of occurrence; all were presumably escaped or released birds. Reports, all of single birds, are of one near Ponca SP, Dixon Co 1 Jan 2006 with Canada Geese, Merrick Co 11 Mar 2006, one photographed at Elkhorn, Douglas Co 29 Mar, Dixon Co 27 Apr 2003, at Kirkpatrick Basin North WMA, York Co 28 May 2016, one photographed near Garrison, Butler Co 6 Aug 2016, a specimen, UNSM ZM-16013, an immature male that hit a powerline and had a clipped toe suggesting it was an escapee, Sep 1988 Gage Co (Tom Labedz, personal communication), one photographed at Branched Oak Lake, Lancaster Co 6-11 Oct 2014 (Michael Willison, personal communication), and 13 Dec 2016 at Holmes Lake, Lincoln, Lancaster Co. There has been an established and expanding population in northwest Arkansas since the 1980s (Smith and James 2012). According to Chesbro (2015), “A final recommendation of this study proposes that northwestern Arkansas is a dispersal point for the Egyptian Goose for more suitable habitats in surrounding areas, and should be eradicated from the area before the species follows other non-native species and becomes invasive.” A report of one in eastern Missouri that may have been from this population returned for a second winter “probably the same bird” 21 Sep 2016 (Chris Stapleton, post to MOBIRDS). Photograph (top) of an Egyptian Goose at Branched Oak Lake, Lancaster Co 11 Oct 2014 by Michael Willison. Chesbro, C.R. 2015. Distribution of the Egyptian Goose (Alopochen aegyptiacus) in northwestern Arkansas and in the United States of America. Master’s Thesis, University of Arkansas, Fayetteville, Arkansas, USA. Smith, K.G., and D.A. James. 2012. 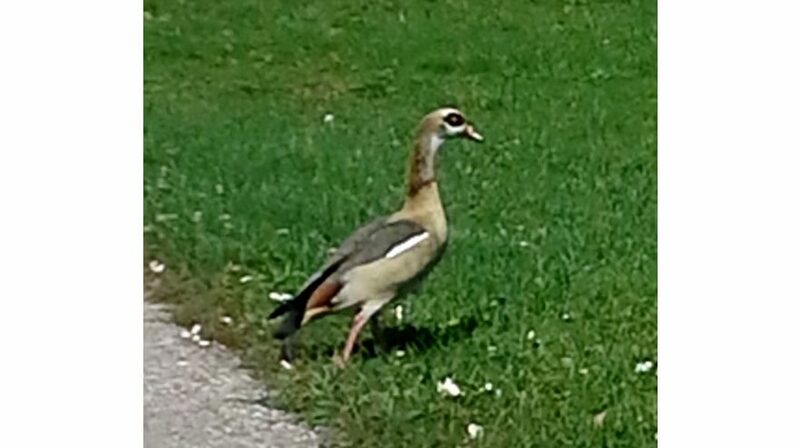 History and current status of Egyptian Goose (Alopochen aegyptiacus) in northwestern Arkansas. Journal of the Arkansas Academy of Science 66: 200-204.